Nadeena Dixon is a Wiradjuri, Yuin and Gadigal (Dharug-Boorongberigal clan) Indigenous Multi disciplinary Artist. Her practice encompasses Print Making and Multi Platform Production including Photography, Animation, Video, Editing, Sound and Webpage Design and Integration. 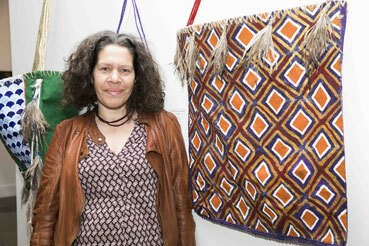 Nadeena is recognised as a Master Weaver in Indigenous Cultural Traditions. Her cultural practices include dance, song, language, songwriting, contemporary theatre storytelling and contemporary ceremony. She is an experienced guitar, singer and performance Artist. Nadeena has a Postgraduate Degree in Indigenous Arts Management (University of Melbourne) and a Master of Fine Arts (UNSW).